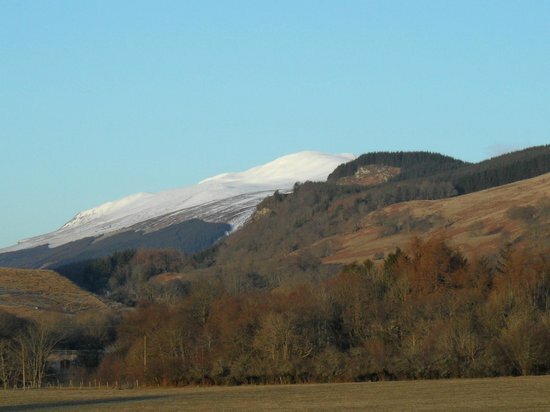 Coshieville is a small hamlet situated a few miles away from Aberfeldy towards the villages of Kenmore and the stunning, incredibly picturesque, Glen Lyon in Highland Perthshire. It is a real hidden gem of a location for your holiday in Scotland. If you are a keen road cyclist you will be spoiled for choice for routes. Those who enjoy climbing on the bike and perhaps have an eye on one day winning(!) the famous polka-dot jersey at the Tour de France will be impressed with the terrain and availability of some categorised climbs close by such as at the Schiehallion road as well as the climb from Glen Lyon to Lawers via the Ben Lawers visitor centre road. If your legs and lungs can handle the exertion you will be rewarded with stunning views as well as exciting descents. The roads are very quiet in this part of the world but do be aware that cars do use these routes, especially during the summer months, so keep safe when you cycle and be ready to use the brakes if required! For those who prefer a more relaxed journey on two wheels there are also many options. Cycle towards Aberfeldy or Grandtully and explore the many fantastic tea rooms for a well earned cuppa or soup. The Watermill bookshop in Aberfeldy is a fascinating place to spend a few hours with a fascinating collection of books as well as an excellent art gallery that features local and contemporary exhibitions. After purchasing a book sit down and relax and enjoy delicious home-made soups, salads, sandwiches and home-baking. Alternatively you may wish to satisfy your sweet tooth, in which case a trip to the Highland Chocolatier at Grandtully is a must. Here you will meet Iain Burnett, the chocolatier who has garnered quite a reputation for the tantalising truffles he produces in this corner of Perthshire. of course, it should be noted that Coshieville features on the route of the fantastic Etape Caledonia cycling sportive, thus the roads have been recognised as excellent for cycling and more and more businesses are catering to those touring and in need of quality sustenance to keep the spirits up! Soups at Highland Safaris in the village of Dull and at Castle Menzies are also well worth a try. Walkers and runners will also have an abundance of trails and hills to explore. Munro baggers should not leave without completing the ascent of Ben Lawers and Schiehallion, both real features of the surrounding landscape. There are also many walks in the area including at Drummond Hill and along the River Tay. Loch Tay hosts an array of water sports in the summer and is also easily accessible from Coshieville. Horse riding is also available. Thus there are plenty of activities for you and the family to enjoy whilst also being in a place where you can relax and completely unwind, far away from the hustle and bustle of your daily life. There are a number of excellent accommodation options in Highland Perthshire including a cosy Bed and Breakfast in Coshieville.